Eleven bounty hunters followed a bad tip from Oklahoma all the way to Arizona, where they confronted Phoenix Police Chief Joseph Yahner at his home earlier this week. 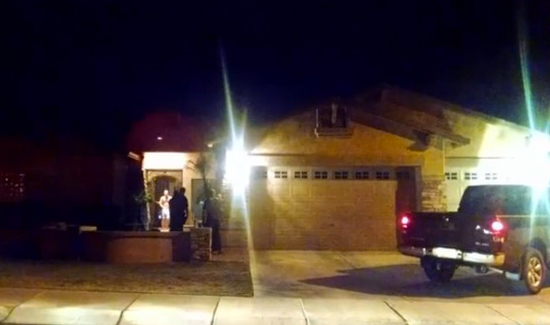 Two fugitive-recovery companies, Delta One Tactical Recovery and NorthStar Fugitive, swarmed the house around 10 p.m. and had multiple trucks parked on the property, the Arizona Republic reported Thursday. Following a verbal confrontation, Yahner opened the door wearing his boxers. The Republic reported that most of the bounty hunters realized their mistake very quickly, but NorthStar Fugitive Recovery owner Brent Farley refused to leave the property. Farley is facing charges of criminal trespassing and disorderly conduct. Click “READ MORE” below to hear the dramatic 911 call made from the Yahner residence.